Avtrade cut the first turf for Second warehouse at Global HQ! Avtrade has broken ground to mark the start of contruction of the second warehouse at its headquarters at Sayers Common in West Sussex, marking the start of Phase 3 of the development of Avtrade HQ, which accommodates the majority of Avtrade's 250+ UK based staff, as well as being home to the 115,000 sq. ft. UK Warehouse & Logistics Hub. 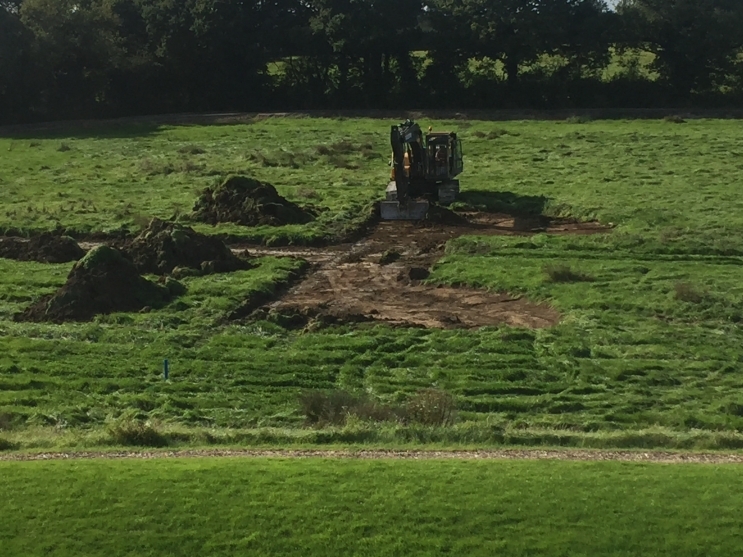 A true representation of Avtrade's fast growth and expansion, sees the commencement of groundworks for the addition of a second warehouse at Avtrade's Global HQ. An exciting time for everyone at Avtrade, to witness a new build so soon after the opening of this new site in 2015. It has been necessary to double warehouse capacity to house Avtrade's rapidly growing inventory to meet Avtrade's expanding global business. The 300,000 sq. ft. West Sussex based head office boasts state of the art contemporary architecture designed by Crowther Associates Architects LLP, commissioned due to Avtrade’s phenomenal growth in recent years and designed to respond to future expansion. The unprecedented increase in inventory acquisitions has resulted in the earlier than planned implemetation of Phase 3 with commencement this month of the construction of the second 115,000 sq. ft. warehouse. The landscaping at the site had been carefully chosen to complement the outstanding rural location, focusing on wild flower meadows, extensive new tree planting, lakes and grass mounds; enhancing the surrounding landscape. The state of the art Headquarters produce over 10% of the site's energy needs through large PV arrays on the roof along with high efficiency ventilation and lighting systems. When the Phase 4 office complex of 35,000 sq. ft. is completed, the development will comprise: the Warehouse & Logistics centre, a second warehouse and two office buildings.